A font is a design for a set of characters and consists of three basic properties: typeface, type size and type style. For example, Times New Roman, Bold, 12 points is a single font while Times New Roman, italic, 10 points is another separate font. Refer to the table below. Selecting the correct font can impact on the overall effectiveness of a document. First considerations must be given to the purpose of the document. Is the document a serious report? If so, avoid fonts that are playful or unusual and select an appropriate formal-looking font that appears more professional. By matching a font to the tone of a document, the text will read easier and the document will flow smoothly from start to finish. Avoid decorative or elaborate fonts. Such fonts can distract the reader from the purpose of the text and draw too much attention to the actual font itself. In the case of an electronic document, select a font that is likely to be available on the reader’s computer. Serif or san serif typeface? (fig. 1) Use serif typefaces for long documents (for example, long technical reports and journal articles) because the characters have distinguishing features that keep the reader interested. 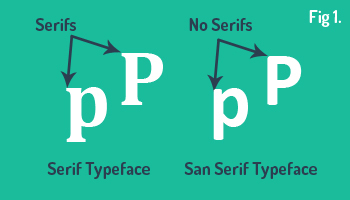 San serif typefaces have an appealing and simple appearance that can be used in short documents for quick accessibility. Both can be incorporated into a document effectively, refer to type style. 10 to 12 pts – Is considered both economical and comfortable for adults. Small type – Use small type when the text is infrequently read. For example, copyright statements and legal notices. Large type – A larger type draws clear attention to a text and further distinguishes it from the rest of the document. For example, headlines and warnings. The use of larger type in PowerPoint works well for making visuals to accompany an oral presentation. This will enable the audience to easily read the information from a distance. The main type styles available for use are CAPITALIZATION, SMALL CAPS, boldface, italics and regular. Apart from regular, the other type styles can be used, occasionally, to give text effective emphasis by standing out. The use of two different styles for headlines and the main text, by alternating styles, will create contrast that increases the effectiveness of the headline text. Readers will be ready for a transition to a new topic and the entire document will appear more organised. For example, sans serif typeface can be used for the main text and serif typeface for the headlines. Once a font has been selected that meets all the guidelines, it’s very important to use it consistently throughout a document. Do not keep switching the font that the headlines are set in, the reader may become confused. Staying consistent will train the reader’s eye and make all of a document’s transitions as smooth as possible. A perfect font can draw attention to important parts of a document, help make reading the text easier, and infuse a strong sense of professionalism and high-quality to all of the text.